See Bulletin No. 2, page 18-20 for notes on the first season. Notes of a talk given by M. Serge Cleuziou to the ENHG on 27/02/78. 1. The Jebel Hafit Period. C. 3000 - 2500 B.C. 2. 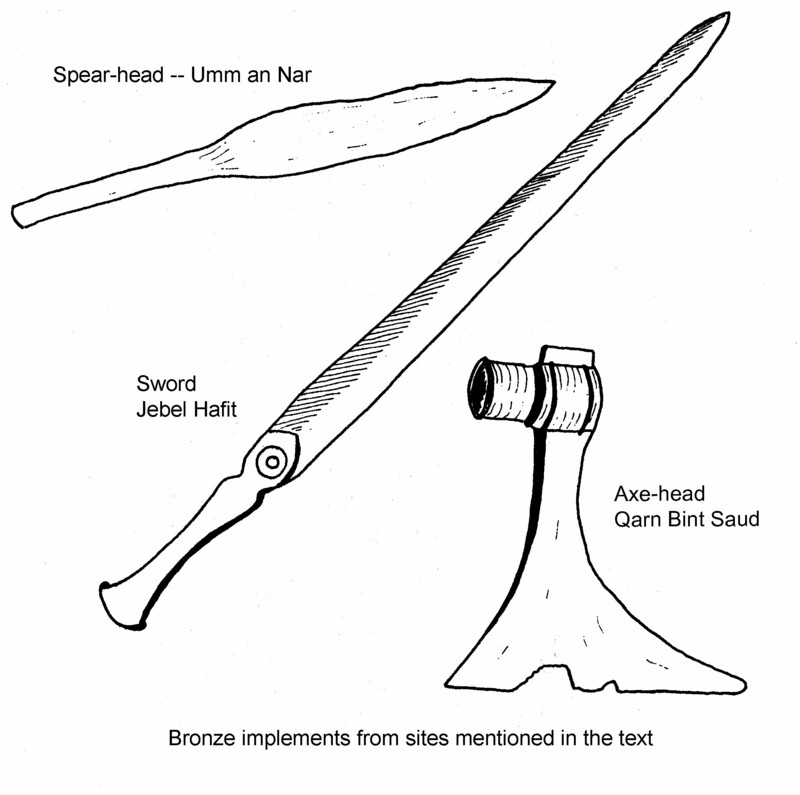 The Hili/Umm an Nar Period. C. 2500 - 1800 B.C. Jebel Hafit lies to the south of Al Ain, and rises to a height of 1150 m above sea level, the surrounding desert being about 200 m above sea level. Nearly all the tombs discovered are on the eastern foothills and consist of 1.5 - 2 m high mounds atop ridges. Every tomb has been plundered. Several small light-brown or red pots were discovered, decorated with black and buff lines. These closely resemble pots discovered in southern Iraq, dated to C. 3000 B.C. However, the Jebel Hafit wares are copies, not imports. The tombs themselves were of stone blocks covered with smaller stones and sand. The entrance was always on the south side. There were two concentric walls, the inner are higher, and the floor consisted of flat stone slabs. There was evidence of up to five separate lootings in some of the tombs. It also seems as if some of them were re-used for burials. Many tombs contained beads and copper pins of a type commonly found throughout the Middle East in the second and third millennia. Evidence of trade is seen in shell beads originating from the Oman coast, and beads of chalcedony, of which the nearest known source is Sind. Apart from some coarse ware, the artefacts found in the tombs were imported luxury goods, not essential implements. This culture covers a wide geographical area, following the foothills of the Oman mountains as far as Aden, though Hili seems to have been the northern limit. The inference is that Umm an Nar was a/the port for exports and imports. At Umm an Nar, the archetypal tomb structure is round, with two floors and two to eight chambers inside, and a door made up of three separate carved limestone blocks. A characteristic feature is the rounded outer surface of each block of the wall. At Hili, the tombs tend to have both north and south entrances, with elaborately carved door-stones, including such motifs as a man riding a donkey, and various animals. Inside the main tomb at Hili, 600 complete pots were found. There are gray ware, made specially for funerals, with animal motifs, particularly cattle. Similar pottery found in Luristan has been dated to 2000 B.C. Another characteristic type is red ware with black line decorations, as found at Umm an Nar. An unusual quantity of copper points was recovered, as well as lapis lazuli jewelry, the nearest source for which seems to have been in Afghanistan. Although the Hili culture is contemporaneous with that at Umm an Nar, there are structural differences. The Hili tombs are larger, up to 25 meters in diameter, and contain up to 24 chambers. At Hili too, the tombs and settlements are closer together. The most recent excavation at Hili was of a building showing evidence of at least five different structural periods. Under the bse of a mud-brick round tower was the remains of an earlier square building. Part of a stone wall on the southern side, of a more recent date, had been cut into by the builders of an Iron Age tomb. A small copper-kiln was found, and also a stone-lined well, but this was too narrow to excavate fully. Probing, however, suggested that the bottom of the well at that time was about seven meters down. Thus the water table was considerably higher at that time. Pottery from this excavation consisted of sherds decorated with a horizontal band of black lines above a series of wavy lines, characteristic of this period throughout Oman. 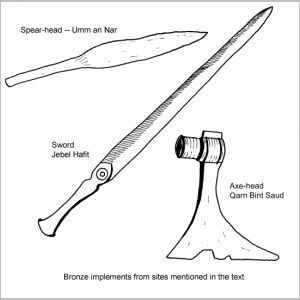 There was virtually no evidence of the funeral gray-ware, but what there was corresponded to the sherds discovered at Umm an Nar. A few copper implements were found. Since the nearest copper mines were 40 kilometers away in the Wadi al Jizi in Oman, it has been suggested that the camel must have been domesticated by this time for transport purposes at least. The argument is fortified by the fact that during the Hili period, the presence of sand dunes would have made the transportation of copper and other goods to Umm an Nar extremely difficult without the traditional "ship of the desert." The later Hili period manifests itself in the site at Qattara, closer to Al Ain, where the discovery of six sherds of Indus-valley type ware suggests a date of around 1800 B.C. Similar pottery has recently been found at Ras al Khaimah. The chief site of this period is at Qarn bint Saud, dating to the end of the first millennium B.C. Similar graves have been found at Ras al Khaimah and at Sumer. Characteristic pottery consists of a green-glazed ware with decorative incisions. Other Iron Age implements found include various axes, spear-heads and knives. M. Cleuziou will be returning to the UAE to resume "digging" in the Al Ain period later in the year.